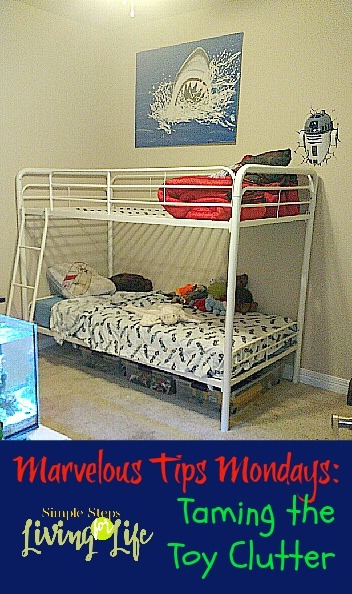 This Marvelous Tips Mondays is all about taming the toy clutter… especially the feet torture devices also known as Legos! This post includes affiliate links for your convenience. For more information please visit my disclosure page. All of my kids have had their share of playing with the giant handmade train table that their Daddy created years ago. They also had lots of fun with building and tearing down and rebuilding the train tracks while watching Thomas and his friends glide around the table, up the little mountains and down the bridges, through tunnels, and more. It’s bittersweet for me that now my youngest is past the stage of wanting to build the tracks and be amazed by the ChooChoo’ing of the toys. Actually for the past 6 months he’s pretty much been past the playing with trains stage. I’ve just put off moving the table out of his room. That means the table was becoming a dumping ground. It also was hard to clean under the giant table and took up a considerable amount of space even though it was tucked under the loft bed. Cleaning the room seemed nearly impossible. For a couple of weeks, I frequently checked Craigslist and Facebook groups until one day I lucked out! 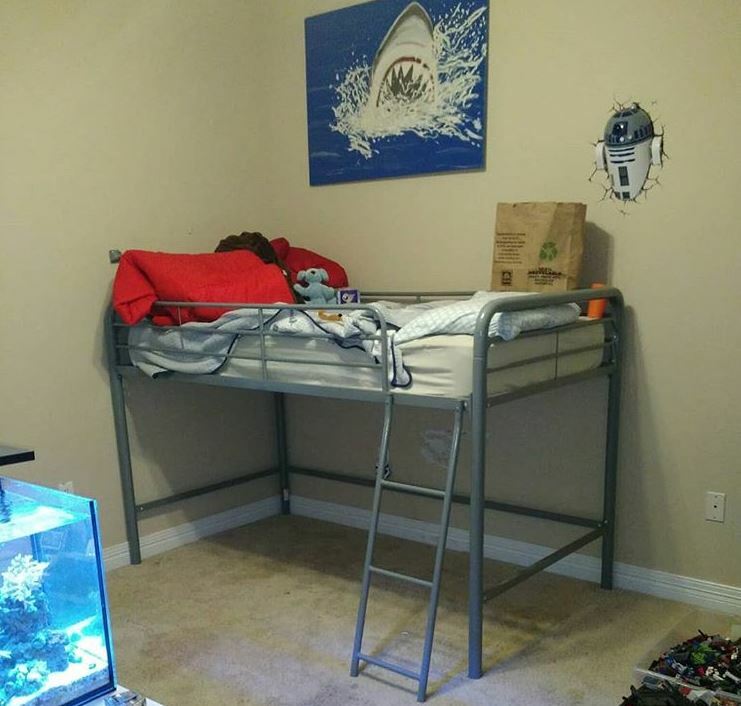 A bunk bed was listed for a mere $75. 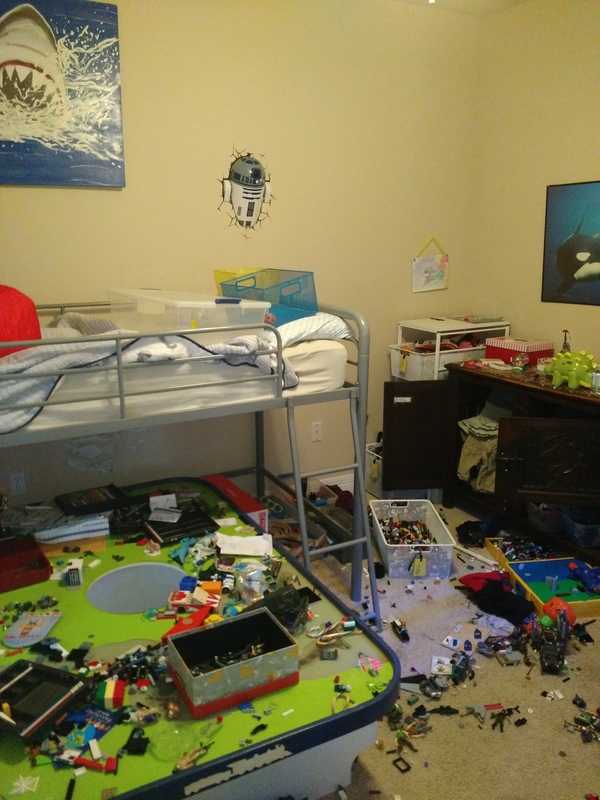 I shared it with my little guy, and he was super excited about changing his room around. Yep, and that’s not even the half of it. Plus, after just an hour of play, the room would look like this because of the limited floor space. Next vacuuming… It was super dirty because I couldn’t reach under the train table very well even with using the hose attachment. 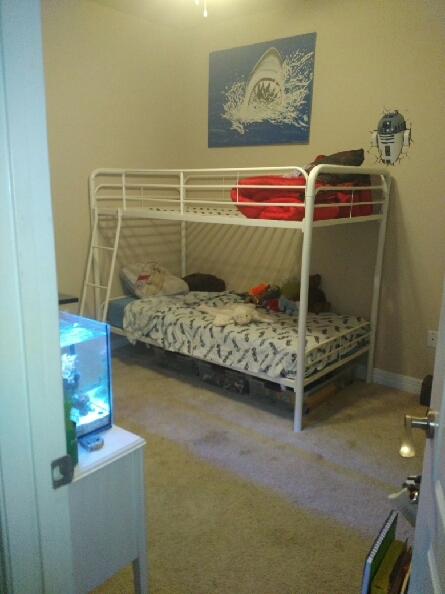 After cleaning it all up, the bed was taken apart and moved out of the room. I could have kept the loft bed for my little guy but it sure was tough getting in bed with him to read night time books. And forget trying to change sheets or make the bed. There isn’t a mattress for the upper bunk yet but I did get 3 large under the bed storage totes. And these are the main ways I’m Taming the Toy Clutter now. My little boy wants to be able to see all his toys at once so having these giant totes for all the toys is working great! He can easily pushed them back under the bed for night time. 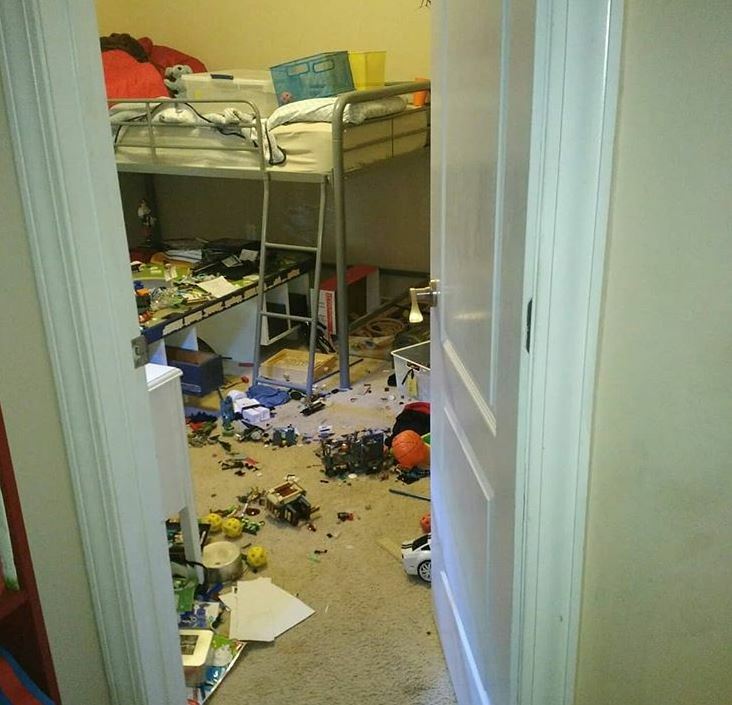 It’s so so nice to go into this room and to have space to walk around, play area, and so much cleaner! Who knew that three simple totes would make such a big difference in keeping a room clean! 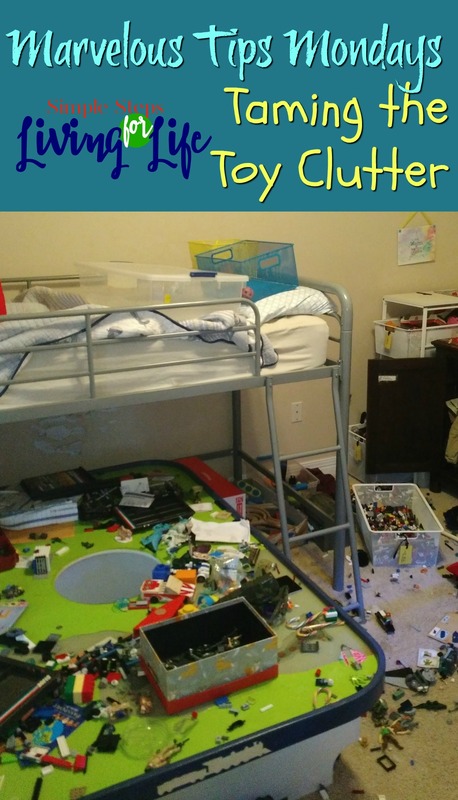 What’s your favorite way for Taming the Toy Clutter?